THE PAL GROUP | Geoplas | PAL Extrusions | PAL Glazing | Fensys | PAL Adhesive Tapes. 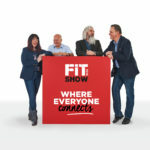 Don’t forget to start making plans to visit us at this year’s FIT SHOW, we will be on hand to talk about the PAL Group’s innovative range of trade products and services. Plastic Extrusion | Roofline Plastics | Bespoke Extruded Building Products | Glazing Seals and Gaskets | Adhesive Tapes | Plastic Decking Products | UPVC Gates and UPVC Fencing. The FIT SHOW runs from 21st to 23rd May at the NEC Birmingham, we do hope you can find time to visit.